HostPro Review 2019: Is HostPro a Good Hosting? An affordable website hosting provider based in Ukraine, providing servers housed in multiple worldwide Tier III and IV data centers. 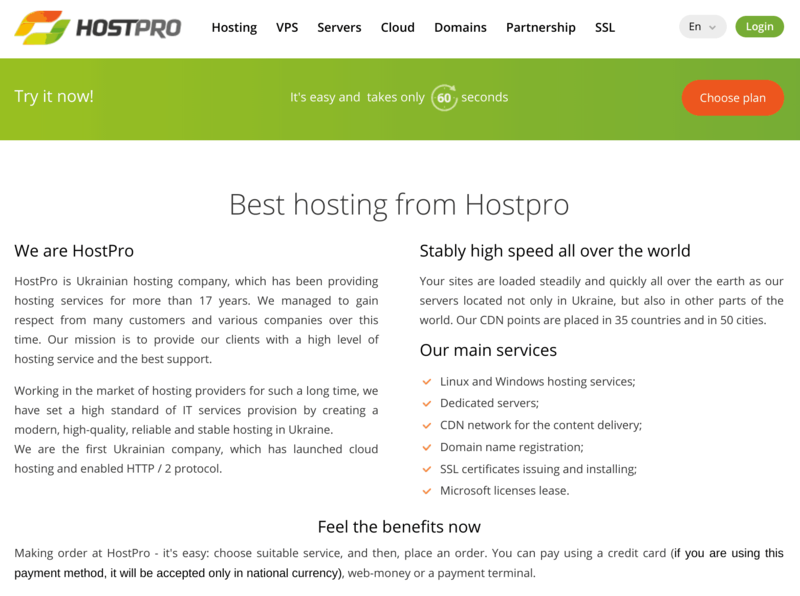 Founded in 2001, HostPro is a Ukrainian-based website hosting provider with their own website available in Russian, Ukrainian and English. Their servers are housed in data centers in Ukraine, Poland, the Netherlands, and the U.S.A. They were the first company in Ukraine to launch cloud hosting with HTTP/2 enabled, and now they also have a cloud service in Russia and the Netherlands. HostPro provides a full range of website hosting services including Linux hosting, Windows hosting, WordPress hosting, reseller packages, dedicated servers, domain registration, and SSL certificates. HostPro’s servers – collocated in multiple Tier III and IV around the world – use RAID 10 SSD storage and employ the HTTP/2 protocol for increased webpage load speed. They also offer many unlimited features such as unlimited bandwidth, email accounts, and subdomains. They have a 99.9% uptime guarantee, but (as confirmed by their support team) with no actual service level agreement (SLA). It means there is no compensation in the event they do not meet 99.9%, which sounds rather more like an aspiration than an actual guarantee to me. HostPro’s prices are competitive when compared to local and international providers. They display their prices in Ukrainian Hryvnias and U.S. Dollars, which is helpful and is indicative of a global customer base. Packages include a free .com.ua domain and SSL certificate, and you are able to host multiple websites. These are nice freebies, and you can also purchase a dedicated IP address and more disk space for a small additional monthly cost. Contract lengths range from a no-obligation monthly contract to a heavily discounted 36-month term. Unfortunately, they do not offer a free trial or a money-back guarantee, so the best way to reduce your risk is to choose a monthly plan initially. Customer service is available via telephone, email, Skype, live chat and support tickets. Technical support times are 24/7, and sales enquiries can be made between 10 am and 6 pm. I’ve contacted them several times, usually via live chat, and their helpful, knowledgeable, and polite people have always picked up within a few minutes. There is also a substantial knowledge base on their website with lots of useful help documents. A Ukrainian website hosting provider with a network of servers worldwide. Their CDN points are located in 35 countries and 50 cities. Wondering how HostPro stacks up against other Web Hosting companies? Enter any other Web Hosting company and we will give you a side-by-side comparison.